I love to teach. I live to teach. I need to teach. 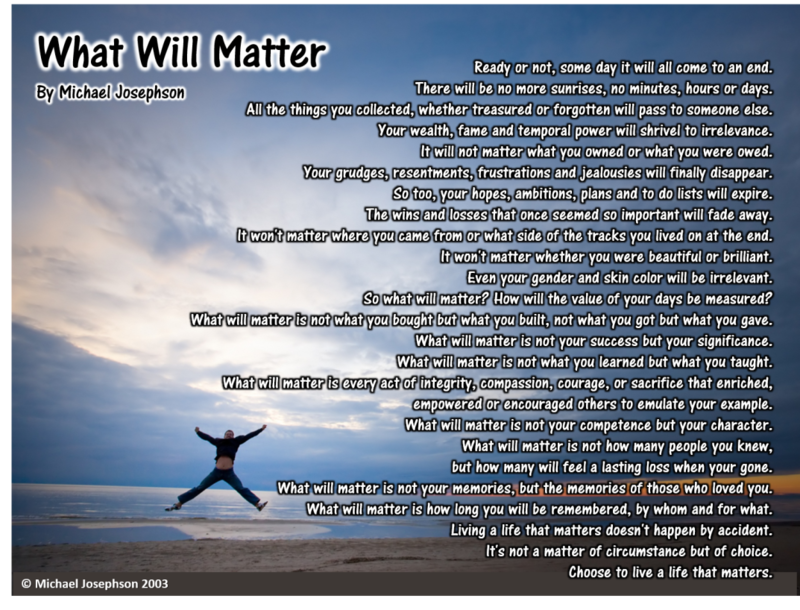 So, in an effort to create a new platform for my teachings I recently created this new website called WhatWillMatter.com. I hope you’ll visit and subscribe and stay regularly engaged in the search for what matters. The name of the website or blog comes from the title of a poem I wrote in 2003. This poem sums up my core philosophy. There will be no more sunrises, no minutes, hours, or days. or sacrifice that enriched, empowered, or encouraged others to emulate your example. I’d love to purchase a professional copy of this poem. Are they available for purchase? Yes, you can get a printed version if you make a tax-deductible donation to the Josephson Institute for of $20 or more (though you can download it for free from the website) You can also get a personally signed version if you make a donation of $50 or more. Please follow this link to donate. Thank you for reminding me of what is important and thank you for continuing on with your work, it is appreciated. What a great poem! For me, it couldn’t have come to me at a better time in my life. It was stated so eloquently and to the point. Thank you so much for sharing it with your readers. I have borrowed your poem three times in my life to honor three people who I thought embodied the sentiments of the poem. On each occasion, there were tears throughout the audience. It is, truly, an inspiring poem. I try to live my life so that someone will honor me with these words. Thank you for all you have done and for this awesome poem. Great poetry, great philosophy to live by! You’re really a breath of fresh air, a flagrant aroma. I am convinced you will be richly rewarded in this life and eternity! thanks for being an inspiration.. I am the chairman of Harties Reflections Swimming club. 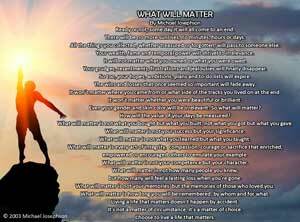 I read your poem What will matter. It was truly inspiring. So much so, that I wanted to know if I can get your permission to publish the poem in our monthly newsletter. My brother was just 46 when he passed away two months ago in an ATV accident. He worked at our family business and my mom finally had the courage to go into his office two weeks ago. My mom found a copy of this poem taped to his wall and it brought so much peace to know it was so important to him. You see, my brother LIVED his life! He didn’t sit back and let his life direct him! He went out and made friends, he lived and worked with great integrity. He leaves behind 3 children and 7 grandchildren, 2 parents, 2 siblings, and countless friends and other family. After his death, we learned about all the people he had become friends with and we live in awe of the friend he was to those people! My supervisor gave me this poem back in 2003. She retired not long after but returned out of retirement to be a consultant. She was in my office and saw it and read it and really liked it and asked if she could make a copy. She did not remember that she was the one who gave it to me. She made a copy but I would like to present her with something nicer. I don’t know if you sell this in a frame or etched into wood or something like that but I would be interested in purchasing for her as a gift if I knew where to find it. How can i get a signed copy of a what will it matter poster? Ive tried going to the website to donate but have been unable to make a donation. Any help is much appreciated, thank you. Thank you for your interest in WWM.